Interpolation method used to construct the pulse train. When the sampling of the pulse train is not exactly in time with the prototype pulse sampling, this node uses the specified interpolation method to get the pulse train samples. nearest 0 Uses the nearest interpolation method. linear 1 Uses the linear interpolation method. spline 2 Uses the spline interpolation method. cubic Hermite 3 Uses the cubic Hermite interpolation method. Lagrange 4 Uses the barycentric Lagrange interpolation algorithm. Amplitudes of each duplication of the prototype pulse in the output pulse train. Delay of each duplication of the prototype pulse in the output pulse train. Prototype pulse of the output pulse train. 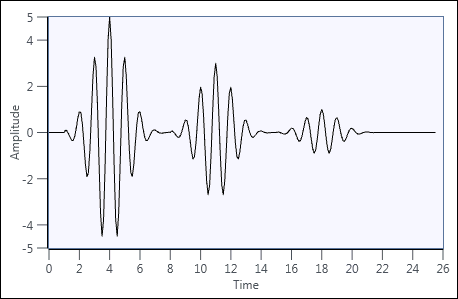 Prototype pulse, which starts at zero in the time axis. Sampling interval of the prototype pulse. 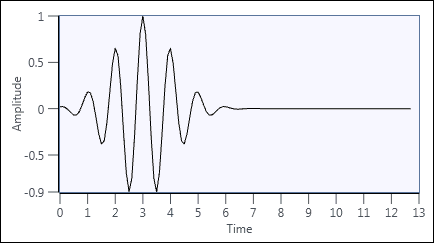 Sampling interval of output pulse train. If Di - Dj is less than the width of the prototype pulse for any i, j between 0 to M - 1, overlap occurs. The following figures show a prototype pulse and its pulse train.